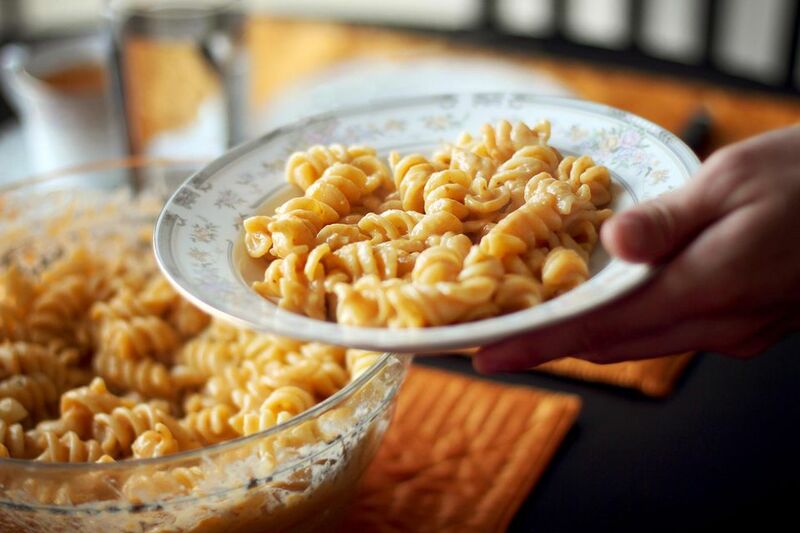 Easy to make and easy to please, this simple gluten-free vegan mac n' cheese recipe is suitable for dairy-free, gluten-free, soy-free, egg free, and vegan diets, and it's healthy and delicious, too. Great, right?! And, of course, this recipe is great for kids with allergies and even those without any. This recipe is also really easy to dress up, so feel free to add fresh herbs and veggies you have on hand to make this recipe extra nutritious and special. Favorite additions of mine include broccoli, spinach, onions, and cherry tomatoes, all of which can be blanched or steamed ahead of time or just tossed in with the sauce. Or, swap out the canola or olive oil for coconut oil for a slightly richer tasting dish. Note: This recipe is suitable for dairy-free, egg free, vegan, and gluten-free and wheat-free diets, but as with any recipe intended for persons with allergies or dietary restrictions, make sure to read all nutritional labels carefully to make sure that there are no hidden dairy-derived ingredients (or gluten, egg, soy or wheat ingredients, if these apply to you). Bring a pot of salted water to a rolling boil and cook the gluten-free pasta according to the manufacturer's instructions until al dente. Drain and set aside. Prepare the sauce. In a small bowl or cup, combine the nutritional yeast, sea salt, onion powder, and garlic powder. Set aside. In a medium-sized saucepan, heat the olive oil or canola oil over medium-low heat. Whisk in the sweet rice flour and continue whisking constantly for 3-5 minutes or until the flour smells toasty but hasn't browned. In a steady stream, whisk in the almond milk or coconut milk, stirring constantly. Add in the nutritional yeast mixture and the rice vinegar, and cook for three minutes more or until the sauce is slightly thickened. If using, add in the gluten-free vegan cheese shreds and mix until just incorporated. Toss the pasta with the sauce and cook for just a minute or two more to reheat the pasta. Serve immediately, serving with freshly ground black pepper and salt to taste.